Caring for Mother Nature benefits the future, and teaching the children to care for it achieves two aims at once. Love Gaia is a collaborative project between members of Soroptimist International Iskandar Puteri (SIIP), the teachers and students from Sri Ara Private International Schools and the Princess Elizabeth School for the Blind in Johor Bahru where they will plant some seeds at Princess Elizabeth School’s vacant land. It first began from growing beds for organic farming to setting up a rain harvesting system, constructed by students of Sri Ara by using simple materials; a 200 gallon tank and piping materials. According to Princess Elizabeth’s Principal, Mohd Dini Karim, the project has been so well received by the students of the school that they rather stay at the hostel in weekends to tend to the vegetable plots and prepare even more plots. Sri Ara and SIIP then paid a visit to the school together with Pantech Group Holdings Berhad to check the harvest. Pantech Group Holdings made a cheque donation of RM2000 to the school while Sri Ara pledged to contribute some paint for refurbishment. 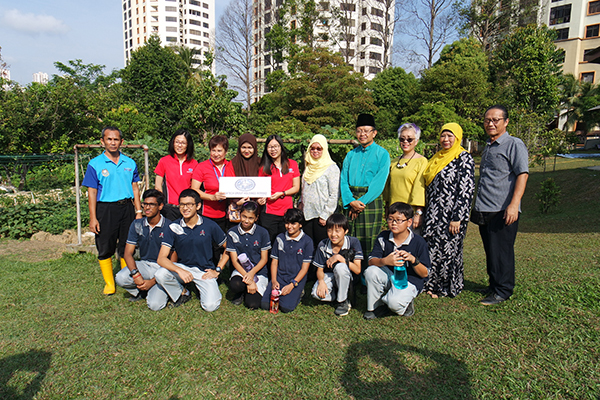 YM Tunku Fatimah Osman Ahmad, President of SIIP said the project has benefited the children of Princess Elizabeth School as they enjoy the feel of lush in their garden. She also suggested that the vegetables should be sold to help fund the repairs and paintwork around the school.